The icy crust of Jupiter’s moon Europa may contain a body of water the size of the Great Lakes sitting just 1.8 miles below the surface. If confirmed, the findings could heat up the prospects of finding alien life on the chilly moon. 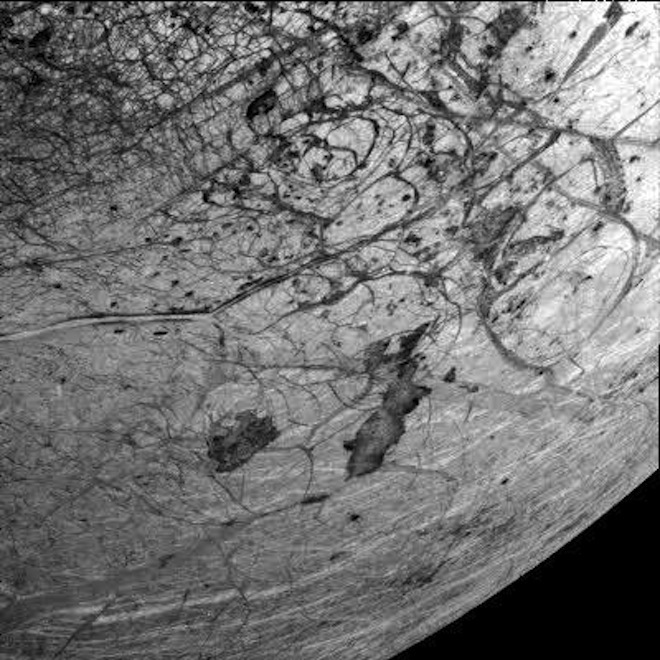 Deep underneath its frozen exterior, Europa is known to house a vast ocean, with two to three times the volume of Earth’s oceans. And researchers have previously speculated that small amounts of water might exist near the moon’s surface in pores or cracks. “Now we’ve found evidence that there are giant liquid lakes perched inside the ice shell,” said planetary scientist Britney Schmidt from the University of Texas at Austin and lead author on the paper, which appears in Nature on Nov. 17. Looking at data from NASA’s Galileo spacecraft — which orbited Jupiter from 1995 to 2003 — Schmidt and her team identified a region called Thera Macula that sits 1,300 feet lower than the surrounding surface. A hypothetical visitor to Europa standing on the edge of Thera Macula would look down at a choppy, brownish field of ice full of knobs and spires, and see tall icebergs trapped here and there. Extrapolating from analogous situations occurring in Greenland or Antarctic ice, the researchers developed a model to account for the chaotic frozen terrain. Plumes of water heated from below would form salty brine that could gather into a lens-shaped subsurface lake. This would cause fractures in the brittle exterior, collapsing the surface ice and bringing it down to mix with the water below. “This would be evidence that there is water below you,” said Schmidt. Sulfates from Jupiter’s volcanic moon Io as well as other chemicals such as oxygen and hydrogen peroxide are present on the Europan surface. These would get stirred into the salty lake sitting beneath Europa’s shell. “This creates a potential source of energy for life to tap,” said geophysicist Don Blankenship, also of the University of Texas and another author of the recent paper. Such findings are exciting to astrobiologists and others searching for life in the solar system beyond Earth. “I definitely think it’s plausible,” said planetary scientist Kevin Hand of NASA’s Jet Propulsion Laboratory, who was not involved in the study. The best thing to increase confidence in the model would be further data, he added. Unfortunately, NASA does not currently have missions to explore Europa on its schedule. The Juno spacecraft, which should arrive at Jupiter in 2016, will mostly study the gas giant’s composition and magnetic field, not focusing on the planet’s moons. A proposed Jupiter-Europa Orbiter has an estimated price tag of $4.6 billion, making it unlikely to launch during a time of budget squeezes.